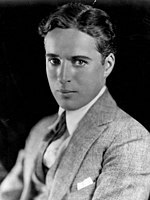 Charlie Chaplin, nomine officiali Charles Spencer Chaplin, postea Sir Charles Spencer Chaplin, natus in Anglia humili loco die 16 Aprilis 1889; Vibisci in Pago Valdensi (Helvetia) die 25 Decembris 1977 mortuus, fuit histrio, compositor et moderator cinematographicus Anglicus, qui multos annos in Civitatibus Foederatis vixit. Puerulus in Londinii vico urbano Walworth habitavit. An ibi natus sit, incertum manet. Ab anno 1913 in Civitatibus Foederatis habitavit, unde (suadente praecipue Herberto Hoover) anno 1952 exclusus Helvetiam usque ad mortem incoluit. Chaplin, Charles. 1964. My Autobiography. Simon & Schuster. Chaplin, Charles. 1964. Die Geschichte meines Lebens. Fischer-Verlag. Germanice. Chaplin, Charlie. 2006. "Die Wurzeln meiner Komik." In Jüdische Allgemeine Wochenzeitung 3.3.67, gekürzt: wieder ebd. 12.4. 2006, p. 54. Germanice. Chaplin, Charles. 1974. My Life in Pictures. Bodley Head. Comte, Michel, et Sam Stourdze. 2002. Charlie Chaplin: A Photo Diary. Steidl. ISBN 3-88243-792-8. Cooke, Alistair. 1978. Six Men. Harmondsworth. Frind, S. 1966. "Die Sprache als Propagandainstrument des Nationalsozialismus." In Muttersprache 76:129-135. Germanice. Hale, Georgia. 1999. Charlie Chaplin: Intimate Close-Ups. Ed. Heather Kiernan. Lanham: Scarecrow Press. ISBN 1-57886-004-0. Klemperer, Victor. 1990. LTI—Notizbuch eines Philologen. Leipzig: Reclam, 1990. ISBN 3-379-00125-2. Frankfurt am Main, 2004. Okuda, Ted, et David Maska. 2005. Charlie Chaplin at Keystone and Essanay: Dawn of the Tramp. Novi Eboraci: iUniverse. Robinson, David. 2001. Chaplin: His Life and Art. Editio secunda. Novi Eboraci: McGraw-Hill. Vance, Jeffrey. 2003. Chaplin: Genius of the Cinema. Novi Eboraci: Abrams. Vicimedia Communia plura habent quae ad Charlie Chaplin spectant. Novissima mutatio die 1 Novembris 2016 hora 16:09 facta.